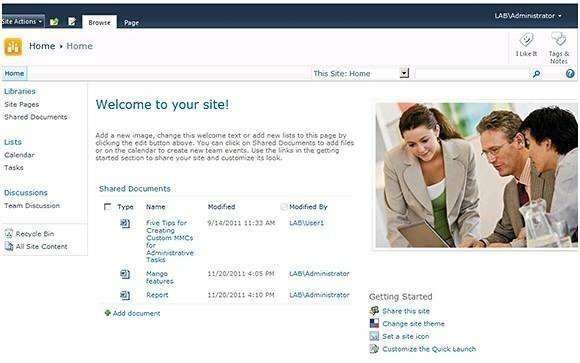 Microsoft has built many new features into SharePoint 2013, including developments in social media, apps for customization and simplified administration. Now that Microsoft's next version of SharePoint has been available in beta long enough for those with the right lab environment to have dug into it a little bit, it seemed the time was right for a brief peek under the hood. 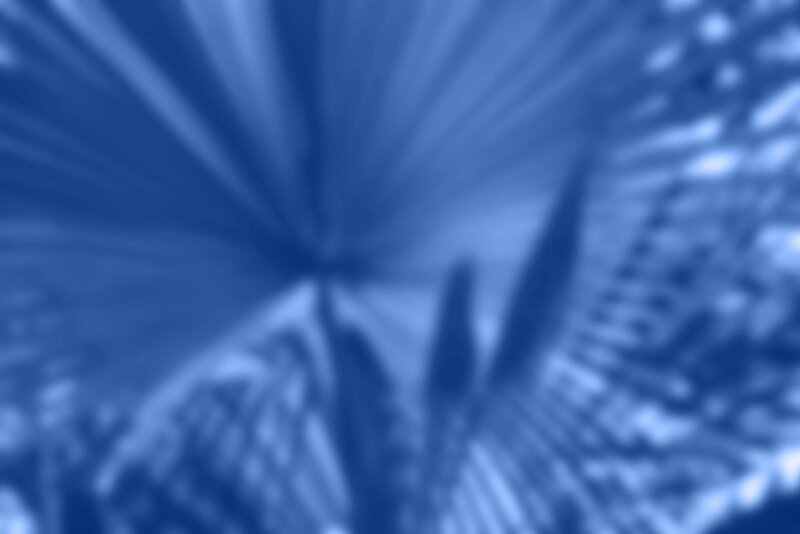 My poking and prodding has revealed some interesting developments worthy of a brief tour of the upcoming collaboration platform. As with any major software release, Microsoft has built many new features into SharePoint 2013. Some of them include added capabilities in the software's embedded Business Connectivity Services feature set, improved claims-based authentication, a new e-discovery functionality, and better support for mobile devices. But since these items have already been well covered in the press, it might be more beneficial to take a look at the new SharePoint user and management interfaces. Figure A: You can use this page in SharePoint 2013 to select a site template. The initial deployment process is similar to the existing process with SharePoint 2010. The Products and Technologies Configuration Wizard is used to prepare the SharePoint deployment. When the wizard completes its operations, you are taken to the screen shown in Figure A. Figure B: This is what a team site looks like in SharePoint 2010. As you can see, SharePoint 2013 uses template-based site creation, just as SharePoint 2010 does. Obviously, each type of site has its own look and feel, but it might make sense to take a look at a default team site for workgroup collaboration to see what has changed in the new version. For the sake of comparison, Figure B shows a SharePoint 2010 team site and Figure C shows one in SharePoint 2013. Figure C: This is a team site in SharePoint 2013. The large tiles in SharePoint 2013, built in what Microsoft until recently referred to as its Metro user-interface design style, can help you to more easily change the look and feel of sites and can be used to add task and information lists, document libraries and calendars to them. And while they are likely to draw your attention, the icons in the site's upper right corner are actually the most interesting and deserve a close look. Figure D: The About Me screen lets SharePoint users edit their user profiles. Also, if you look in the upper right corner of Figure C, you can see that the site administrator is currently logged into SharePoint. Clicking the down arrow next to the name of a user who is currently logged in brings up a menu with an About Me option. Profile contents that are enabled by that user are displayed for coworkers to read. Such contents are indexed so users can search for other users in the company based on the profile. For example, a user might search for a user in HR, or a user who has worked on a certain project or account. Choose this option next to your own name and you are taken to a screen like the one shown in Figure D that lets you edit your profile. There are several benefits to this screen. First, it provides users with easy access to task lists and newsfeeds with information about recent activities in a SharePoint system. More importantly, it is where users go to edit their profiles. Keeping user profiles up to date is crucial because of all the metadata SharePoint stores in them. In large organizations people often perform searches in SharePoint systems to find users who might be involved in a specific project or have expertise in a certain area. One of Microsoft's intentions with SharePoint 2013 is to make the platform more social in nature, and a large part of that social focus comes down to the user profiles. If you look back at Figure C, you will notice a blue bar to the left of the name of the user who is logged in; it provides another easy access point to the newsfeeds and the sites that the user is following. These feeds are specific updates the user has chosen to keep track of. You will also notice that for the first time, SkyDrive access is built directly into SharePoint. SkyDrive is cloud storage provided by Microsoft. 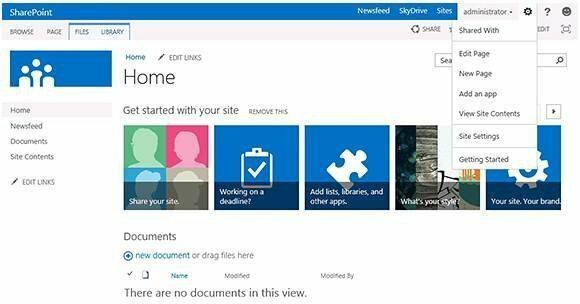 For the first time it will be possible to upload SharePoint documents directly to SkyDrive or to download content from SkyDrive directly into SharePoint. The cool part is that SkyDrive is Microsoft's preferred storage medium for Windows Phone 7 and for Microsoft Office 2013. This should help to make it easier for mobile users to move data to and from SharePoint. 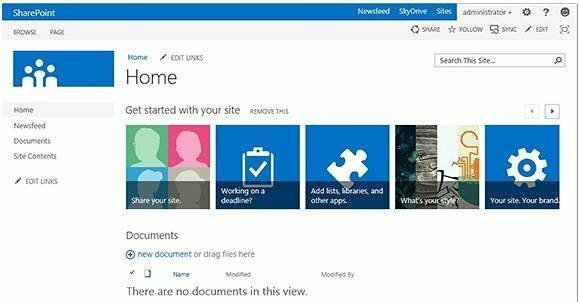 Figure E: You can use this menu to add apps to a SharePoint site. Another page element that is worth paying attention to is the gear icon just to the right of the name of the logged-in user. Clicking this icon provides options to edit the page or create a new page, as shown in Figure E. It is also worth noticing in Figure E that the menu provides an option for adding an app. 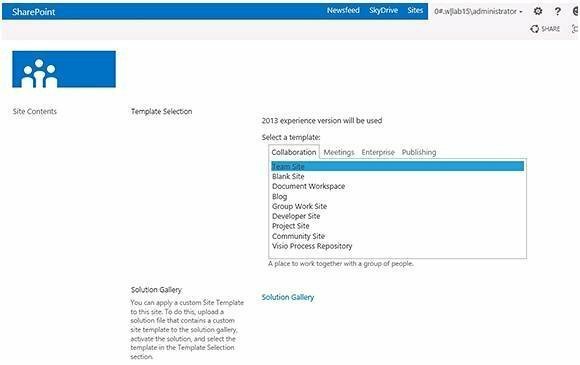 This is another of the new SharePoint 2013 features: SharePoint sites can be enhanced with small, lightweight apps Microsoft, third-party software vendors or user organizations themselves created. For example, suppose you have a SharePoint site that contains a list filled with customer contact information. You might use a Bing Maps app to provide mapping capabilities for the addresses on the list. Another possibility might involve adding a Skype app to SharePoint to facilitate audio and video communications between users. SharePoint has always been very customizable. The problem is that in the past it took some pretty serious programming skills to do anything more than basic customization. This has been a pain point for organizations that want to tailor SharePoint to meet their own unique needs. Being able to add what are essentially Web apps simplifies matters. Figure F: The Site Settings page now has a Search section. Many SharePoint administrators might be wondering how the management tools are changing in SharePoint 2013. 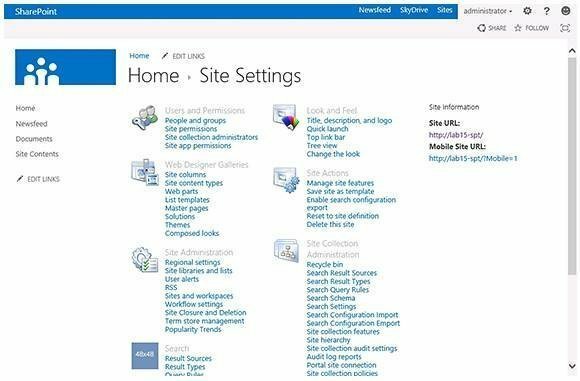 The Site Settings page is very similar to the way it looks in SharePoint 2010. A few options have been moved around, but an experienced SharePoint 2010 administrator shouldn't have much trouble adapting to the new format. The biggest change is that many of the search-related settings now appear in a separate Search section, as shown in Figure F.
Many of these settings previously appeared in the Site Collection Administration section, and they still do in the current build of SharePoint 2013. But I expect that Microsoft will remove the Search options from the Site Collection Administration section in the final release. Having a standalone section should make search administration a lot easier for less-experienced SharePoint administrators. Figure G: The SharePoint 2013 Central Administration console bears a strong resemblance to the 2010 version. 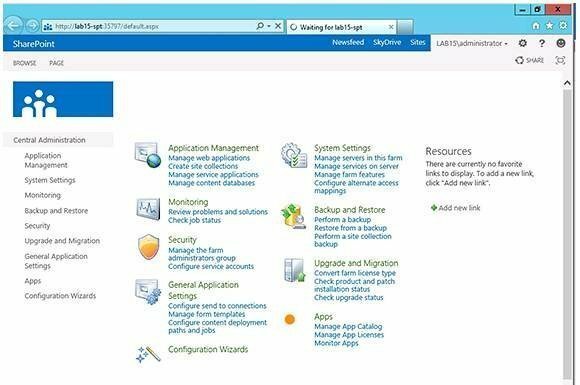 The SharePoint Central Administration console remains virtually unchanged from the current version of SharePoint. As you can see in Figure G, the biggest difference on the console's main screen is the addition of an Apps category for managing your internal App Catalog and licenses for external apps purchased from a new SharePoint Store that Microsoft is setting up. There is also a function that allows you to monitor apps for errors and license usage. Errors could be anything related to an app’s performance or functionality. Some apps have internal logging or diagnostic mechanisms that report the app’s status to SharePoint. Like with any software, it is important for organizations to ensure that they comply with apps licenses. Administrators will be able to track license usage directly through SharePoint, which should be a tremendous time and effort saver. The administration console is also a central location from which they can verify that all of the apps added to SharePoint are working properly. It sure beats having to verify each app's state individually. While Microsoft still has a lot of work to do on SharePoint 2013 before the general release, it looks like the new version is more of an evolutionary release than a revolutionary new product. Even so, I do think that SharePoint 2013 will be worth the upgrade. This will be especially true for organizations that want to customize SharePoint, work with a simplified user interface and expand cloud storage capabilities. Brien M. Posey is a Microsoft MVP with two decades of IT experience. Before becoming a freelance technical writer, Posey was chief information officer for a national chain of hospitals and health care facilities and a network administrator for insurance companies and the Department of Defense.